So much going on here that I haven't had much time to sit and compose anything coherent. Thursday the TMNT passports made their debut. There are three booths that you run around to to get stamps and eventually throw your name into a fishbowl to enter a giveaway. 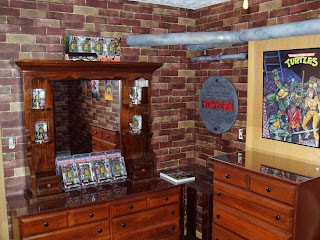 But if you aren't at Comic-Con, don't fret - the contest being entered here is exactly the same thing you enter yourself in through the newly launched TMNT25.com Web site. Yesterday afternoon myself and Tokka got to briefly meet and converse with TMNT writer Jake Black and TMNT artist Dario Brizuela, both of whom are fantastic people. I also met with Jake again briefly today. He reports that TMNT director Kevin Munroe is wandering the show floor, though I haven't seen him around myself. You can view all of my Comic-Con photos here, although not all are TMNT-related. SAN DIEGO, July 24, 2008 – Mirage Studios, Inc. and 4Kids Entertainment, Inc. announce the launch of an exclusive Teenage Mutant Ninja Turtles (TMNT) Website, created for the fans who have made everyone's favorite heroes in a half-shell a staple in pop culture for a quarter of a century. TMNT25.com, unveiled today at Comic-Con International, is the official destination for the Turtle's 25th Anniversary Shell-ebration in 2009. Fans will have the opportunity to register on the site to receive up-to-the-minute 25th Anniversary information and locations for special events, as well as the chance to win rare collectibles and prizes and much more, via the downloadable Turtles widget. In addition to the launch of the site at Comic-Con, show attendees will have the opportunity to participate in a pre-Shell-ebration Sweepstakes, which they can enter by collecting stamps on a specially crafted TMNT25 passport at several participating partner booths: (4Kids Entertainment/TC Digital Games LLC (Booth #3351), uclick LLC (Booth #1217), and National Entertainment Collectibles Association (NECA) (Booth #4345). 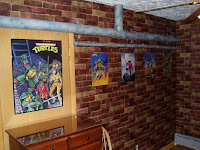 Once all the stamps are collected and the passport tear-sheet is handed in, fans are entered to win a number of special prizes including a signed NECA TMNT collectible toy set, a Raphael costume from Disguise, Inc. and a mobile phone from uclick. 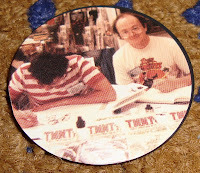 Additionally, by participating in the pre-Shell-ebration Sweepstakes, fans will be automatically entered in an online TMNT Cyber Sweepstakes, where they will have the chance to win rare copies of Gobbledygook, the limited Mirage Studios comic series which previewed the Turtles back in 1984, each signed by Turtles co-creators Peter Laird and Kevin Eastman. "Launching the TMNT25 Website is an exciting first step for Mirage Studios in the multi-faceted Shell-ebration of our historic milestone," said Gary Richardson, CEO of Mirage Studios. "This will be the go-to place for our fans to log on to reminisce in Turtles' multi-media history, as well as receive the latest news on all the exciting anniversary initiatives in which they can participate." Peppercom, a strategic communications agency, and its experiential marketing division, Peppercommotions, will manage www.TMNT25.com, as well as the various Shell-ebration events. "We're confident that the TMNT25 Website will help generate a strong buzz for fans and serve as an important promotional resource for Turtles' licensees, partners and retailers," said Rosalind Nowicki, Executive Vice President, Marketing & Licensing, 4Kids Entertainment. "The Shell-ebration will bring back nostalgic memories, as well as create exciting new experiences for TMNT fans of all ages." Throughout 2008 and 2009, the TMNT25 team will host several interactive initiatives for fans during the action-packed anniversary, including nationwide tours, events and activities including "Galabungas" – TMNT-style parties in key U.S. cities – to celebrate the TMNT phenomenon throughout the years; and a mobile reunion tour that will travel across the country bringing families and friends together to participate in TMNT-themed events. The Teenage Mutant Ninja Turtles made their world premiere in May 1984, in a comic book created by Peter Laird and Kevin Eastman and published and distributed by Mirage Studios. A hugely successful TV series quickly followed, along with three successful theatrical films. In 2003, the Turtles were re-introduced to a new generation through a fresh animated television series, a CGI-animated theatrical movie and new merchandising program. 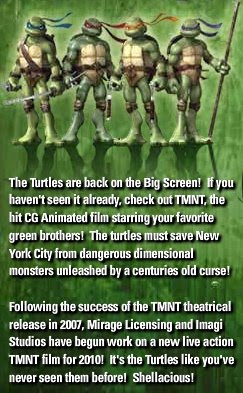 The 25th year of TMNT will provide fans with radical, new, stimulating opportunities to experience the Turtles. It's been a long day, but we've all survived the monster that has become Preview Night. This used to be a time to run around the Con floor with a smaller crowd, but the crowd was in force tonight. Tonight's big items came from the NECA booth where the Black & White box set of figures ($50) was for sale along with the Mouser 3-pack ($20). Also on display were three new figures due for release this fall: Shredder, a Foot Soldier (with Utrom), and a Foot Elite. Kevin Eastman's Bodycount reprint ($20) is a hit as a long and regular line formed at the Heavy Metal booth where Kevin was personally doing detailed and intricate sketches in each one (no additional fee). Those two stops and buying way too many Doctor Who action figures were literally all I got accomplished tonight (although that's all I was aiming for), so I barely got a look at the Con floor. There's more Turtle goodies hiding around somewhere. The passports weren't out tonight, but supposedly will be tomorrow. And virtually all of my day tomorrow is dedicated to Doctor Who, so I might not see too much else until Friday. We'll see. Tales of the TMNT #48, “The Decider,” is in comic shops today. Be sure to check out the fantastic pinup art in this issue by the one and only tokka!! The day has finally arrived! Comic-Con is here! Well, in truth it is Monday night and I'm writing this in advance as I will likely still be driving towards San Diego when this shows up on the Web. But I'm taking this moment to give a final run-down of know TMNT-related events happening at the Con. Comparatively, it's not much. But it is more than last year, so it's not all bad. 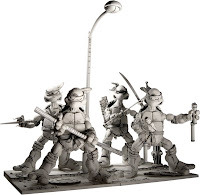 TMNT Black & White Box Set - Limited to 500 pieces, retail price $50. Get yours signed by Kevin Eastman at the NECA booth on Thursday from 2pm-4pm. TMNT Mouser 3-Pack - Edition details and price unknown (will update Wednesday night). Pickup the limited hardcover reprint of BODYCOUNT by Kevin Eastman and Simon Bisley at the Heavy Metal booth, booth #1629. Softcover may also be available. I'll update with prices Wednesday night. Details on these remain vague, but they will apparently be available from a handful, if not all, TMNT licensees exhibiting at the show. It sounds as if stamps can be collected as part of a competition for prizes. Also, be sure to watch TMNT25.com, which is said to go live during the convention. Tales of the TMNT artist Dario Brizuela will be signing at the IDW booth Thursday from 4pm-5pm. Lastly, you can feel free to follow my Twitter feed for news as it happens (assuming Twitter decides to upload my texts). I'll try to do a full report each night (if there's anything to report), but Twitter is a way for me to post news immediately. Do be aware that not everything posted to Twitter will necessarily be TMNT-related. In fact, it's very likely to be heavy with Doctor Who blithering. Especially Thursday. BludBlood.com has a new interview of Tales of the TMNT writer, Tristan Huw Jones. 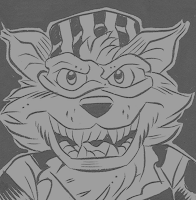 Tristan talks about Tales #36, the upcoming Tales #50, and miscellaneous other things. 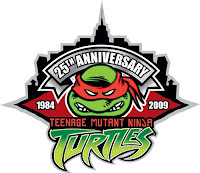 If you have a Twitter account, you can now follow TMNT news via the new TMNT25 profile. This looks to be an extention of the TMNT 25th anniversary "shell-ebration," which officially kicks off next week during San Diego Comic-Con. Stay tuned next week for complete coverage of Comic-Con and all TMNT news that crosses the floor of the convention hall. Yesterday it was reported that Playmates was confirming a new CGI/live action movie to be released in 2010. Today that news was quashed by Steve Murphy of Mirage. Oh Playmates, have you really sunk that low to put lies on your Web site? Following the success of the TMNT theatrical release in 2007, Mirage Licensing is in negotiation with several companies about a new TMNT movie for release in 2010. Fingers and toes shall remain crossed at good news in the near future! Fan Goongasnootch recently shot these two videos from the Indianapolis Children's Museum's exhibit on comic books. Both videos showcase how the TMNT are featured in the exhibit - Very cool! It seems that fans tOkKa's and Putrescent's eyes have served them well and they have spotted some updates to Playmates' Web site. There are some toy updates and a little bit of info on Back to the Sewer if you want to go looking, but the big news comes in the form of two paragraphs that reveal plans for a CGI/live action movie to be released in 2010 (see graphic). As fantastic news as this is (although not completely surprising, as it has been somewhat hinted at), I find myself full of caution as I try to be optimistic. Imagi's continued involvement is what concerns me most. The reason a full-CGI sequel agreement never happened between Imagi and Mirage was, seemingly, differences in opinion on where to take the story. Deciding to do a CGI/live action hybrid movie doesn't mean you don't have to worry about telling a good story. And as much as I absolutely love the look of the 2007 movie, I don't know how well those Turtles will blend with live action. I'm afraid this effort is going to come off looking like Garfield, when it really needs to look like Transformers. I suppose only time will tell, so I will keep my fingers crossed that everyone involved in this project is truly interested in making a good movie and not just in selling another batch of action figures and other licensed crap. Hopefully we'll get some more concrete info on the project in the near future. 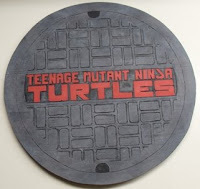 Check out this awesome, homemade TMNT manhole cover that Hans made! My name is Hans and I've been an avid Turtle fan since the 80s. With the 25th Anniversary coming up I'm redecorating one of my bedrooms. I've come up with some great ideas and thought I'd just share one with you and anyone who would be interested if you decided to post it. If you look at the attached file, I made a custom mahole cover out of plywood, woodburning, paint, and plenty of free time. It took a couple days and the pics dont do justice. I'd recommend it as a fun craft project, plus it looks great on display. I only recommend patience and safety with the saw and woodburning! You can take a look at the progress pictures of the manhole cover here. I think it's just fantastic! 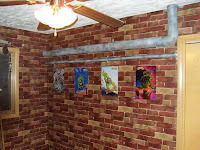 UPDATE: Hans has provided pictures of the finished room!